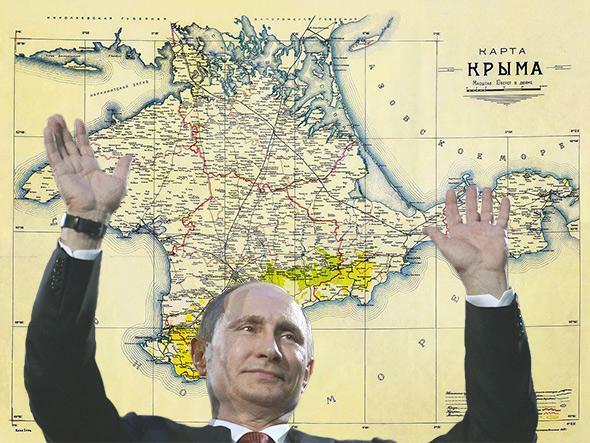 National Geographic maps Crimea as Russian: Maps can determine destiny. How we map the Crimean Peninsula may determine its destiny. The way National Geographic is treating Crimea is fine by Putin. After word came down this week that the Crimean parliament had officially voted to secede from Ukraine and join Russia, Western governments immediately condemned the move. But one influential institution broke ranks to recognize the peninsula’s new political status: National Geographic. Not two days after the vote, the magazine’s editors decided to update its maps of the area to show Crimea as a part of Russia—shading it as a disputed territory, similar to the way it handles Gaza and the West Bank. If Russia votes to annex Crimea, the magazine says, it will take away the shading to show the territory as a full-fledged part of the Russian Federation. “We map de facto, in other words we map the world as it is, not as people would like it to be,” the magazine’s chief geographer told U.S. News & World Report. The fact is, however, that very little about mapping is de facto or absolute. Maps always show the world as we their creators choose to interpret it—often reflecting political motivations or desired reality as much as objective geography. As it is in history or politics, perception is everything. Not only are maps made by the victors, but often they foreshadow or even determine victory before the fact. History abounds with examples. When the Portuguese under Henry the Navigator were rounding Africa, their mapmakers spread Portuguese flags along the coastline as they went, marking locations of slave markets and softening up the continent for eventual colonies. More than a century later, Captain John Smith (of Pocahontas fame) produced a map of the area north of Virginia in 1614 that not only coined the name New England, but also replaced the names of native settlements there with fictitious English town names. The map was a shot across the bow of French and Dutch settlers, claiming the territory for King James—but it was also an unprecedented act of virtual colonization supplanting Native American villages in imagination long before settlers conquered them in reality. Three years later French cartographer Guillaume De L’Isle—arguably the greatest mapmaker of his time—countered with a detailed map of the interior that splashed “La Louisiane” in giant letters across the continent, squeezing the English colonies in a tiny inset across the coast. De L’Isle’s map was much more accurate then Moll’s—showing that it was the French who in fact controlled the Ohio Valley no matter what the English claimed. Indeed, the English used De L’Isle’s map for decades as the basis to draw their own. But after the English won the war in 1763, negotiators used less accurate English maps to draw new boundary lines—finally giving them victory in the war of both weapons and maps. Map wars have continued over the centuries. During the Cold War, American students took for granted that the United States was located in the center of the world, with Asia split to the left and right. Soviet schoolchildren, meanwhile, grew up with world maps showing Asia in the middle (dominated by the Soviet Union) with North America split in two. In the 1970s German journalist Arno Peters exposed the fraud within the world’s most common map projection, the Mercator Projection, which distorts the size of countries farther away from the equator—emphasizing the United States and Europe over developing countries in the “global south.” His own projection reversed this trend, shrinking the developed countries and emphasizing Africa and Latin America. Years later the map made a cameo in an episode of The West Wing in a fictional storyline that had a group called the Organization of Cartographers for Social Equality appealing to Josh and C.J. to make such maps mandatory in American schools. And so it goes: India, Pakistan, and China all use different maps to define the boundaries of Jammu and Kashmir. Moroccan maps include the disputed area of Western Sahara as part of the kingdom. China uses ancient maps to assert its legitimacy over Tibet. Israelis and Palestinians refer to maps created in 1919 and 1947 as the basis to claim their own boundaries. And deserted islands the world over change color on paper depending on which country is mapping them. The fact is, the very act of trying to render three-dimensional geography on a flat surface forces the mapmaker to make choices about what to include and how—and that includes interpretations about who they think controls what. As maps of territorial claims over the years in Africa, Asia, and North America have shown, those depictions can then have a big influence on later events. If history is any lesson, then as the conflict in Crimea plays out in the coming weeks and months, the maps made of the region may not only reflect the reality on the ground, but also help create it.